Last month I gave you a homestead energy update, about how Dan and I have made small steps with both decreasing our energy consumption and utilizing more alternative energy devices. I also admitted how impossible a switchover to a true off-grid lifestyle seemed to be. 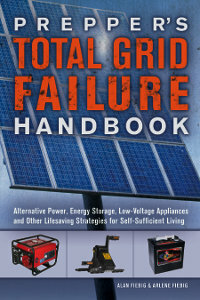 Then I got a copy of this book, Prepper's Total Grid Failure Handbook by Alan Fiebig and Arlene Fiebig. What I really like about this book is how it breaks down a complicated topic into a series of understandable explanations. It is very well written and even those who aren't interested in preparedness and alternative energy would likely get hooked by the prologue ("A Cautionary Tale"). Then comes the introduction, in which we read that on the very day the Fiebigs moved to their off-grid property, they hooked their computer up to a battery and blogged about it! The book is divided into three parts. "Part One: Earth, Wind, and Fire: Generating Renewable Energy," discusses the basics of the various familiar sources of energy: water, wind, and sun. It explains the various kinds of generators and fuels to power them, plus their pros and cons. It goes on to give a good introduction to electricity and how to determine how much you need, including a number of non-electric alternatives for common things we do. A chapter on people-powered generators is included. "Part Two: You Are My Sunshine: Working with Photovoltaic Power," gets to the nitty-gritty of solar energy. The concept is simple, but the how-to gets complicated, yet the Fiebigs break it all down in a sensible way. Discusses various kinds of solar panels and batteries, plus how to care for and maintain them. I think this book the best primer for off-grid energy that I've seen so far. Explanations are excellent, especially for someone for whom this is new territory. 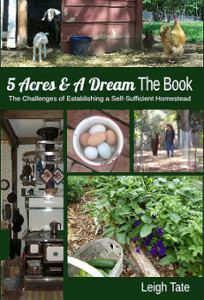 Even for those with a basic grasp of the concepts, this book brings off-grid living into the realm of doable. I especially appreciate that the authors don't try to push any particular system or product. They give you the facts including the positives and negatives, and let you decide what's best for your needs and situation. I respect that. The only thing I think the book is lacking is a good glossary. More information is available at the publisher's website, Ulysses Press. The book itself is available in both paperback and Kindle versions at Amazon.com. Sounds a good read. I'm really getting there with the food side of self sufficiency but energy wisector I've made no head wah. Budget just doesn't allow it at the moment unfortunately. Yes, budget is always the obstacle! (We have the same problem.) What's interesting about this book is that these folks work completely off of 12-volt batteries, i.e. they have a 12-volt off-grid system (direct current) as opposed to the commercial standard which uses alternating current (more complicated for DIY and hence more expensive). We recently bought a solar 12-volt battery recharger, so I'm going to try some smaller applications to see what we can do. when i read the articles on solar energy i am lost before the first paragraph is read. this book looks like it will be much help. thank God someone with a brain put this together for us nontechnical types. if we were all like me we wouldn't have invented the wheel yet. on the other hand there would be no atom bombs, either! The folks who wrote this book have a Sun Oven! I like how they defer the big energy tasks to alternatives (like cooking), and save the electricity for other things, like light and electronics. Those things I can experiment with without a huge outlay of money. If I can make some progress rather than none, I'll be happy! I would love to reduce our reliability on the power suppliers but the outlay at my age wouldn't really see a return. So I rely on buying energy efficient appliances and a well insulated home. We're in the exact same boat, and have found that the energy improvements we've made to our home have made a tremendous difference. We've also been investing in small solar items like our attic fan and barn light. This book gives me hope that we can continue to head in that direction without a huge expense. Baby steps! Wow, Rain, that's high! Very crazy indeed. I know you will really be happy to get a place of your own when the time comes. Our electric company offered us an equalized monthly payment plan one time, but when I did the math, I found they were adding an extra month of our average payment onto it so that in a year we would actually pay for 13 months worth of electricity. We decided to see if we could bring the cost down ourselves and were able to do so. Deborah above took the words right out of my mouth. I am fascinated and interested in solar but I'll start reading an article or even some blog posts by people who do it and I get lost really fast. Our barn and shed are not connected to power yet. But in reality we don't need a lot of it out there. And we have these nice, new, big roofs just sitting there in the sun all day. We've thought that might be a good place to get our feet wet. Thanks for this, will pick up a copy. Solar power and wind energy have peaked our interests. Thank you for posting about this book, this is one we should add to our resource library. We have the same situation - no electrical company power to the outbuildings. I am so glad I went with my solar barn light!. Now I'm looking forward to trying some other small projects thanks to this book. Sandy, every little bit helps! Thank you for that excellent review! I have been looking at a couple books but never got one and there was one at Walmart today that I almost got....it could have been that one but I'm not sure now. I definitely will buy this one that you reviewed! Thank you so much! It sounds like it's perfect for me...the beginner! Happy Memorial Day weekend! I have checked out books from the library but so many of them want to start by helping you figure out how much electricity you use in your current lifestyle, and then build the system from there. I always find that discouraging. What I like about this book is that it's helping me understand how to start small and simple, and then gradually work my way to more complex applications. We may never get totally off-grid, but we're going to be able to ease off from our dependency on it quite a bit. I hope it does the same for you! As far as the Fiebigs, they blogged via battery but just how and where did they acquire an internet connection? Thanks! Cell phone service! I believe that would be called a "hot spot?" Arlene, you are so welcome! 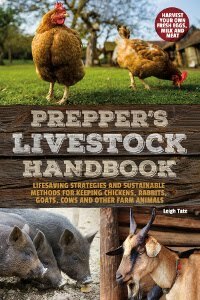 It's just the book I've been looking for, because you all do an excellent job of explaining off-grid living in an understandable way. Based on your book I'm working on some small projects to help me get some hands-on experience and understanding. I don't see us being able to get off grid, but I do see expanding the way we use solar energy. You're my kind of folks!